Broccoli & Shredded Brussel Sprout Salad – crunchy and tangy, this salad is perfect for a light lunch or a side dish for a larger meal. It would also be worthy of a spot on your holiday table. 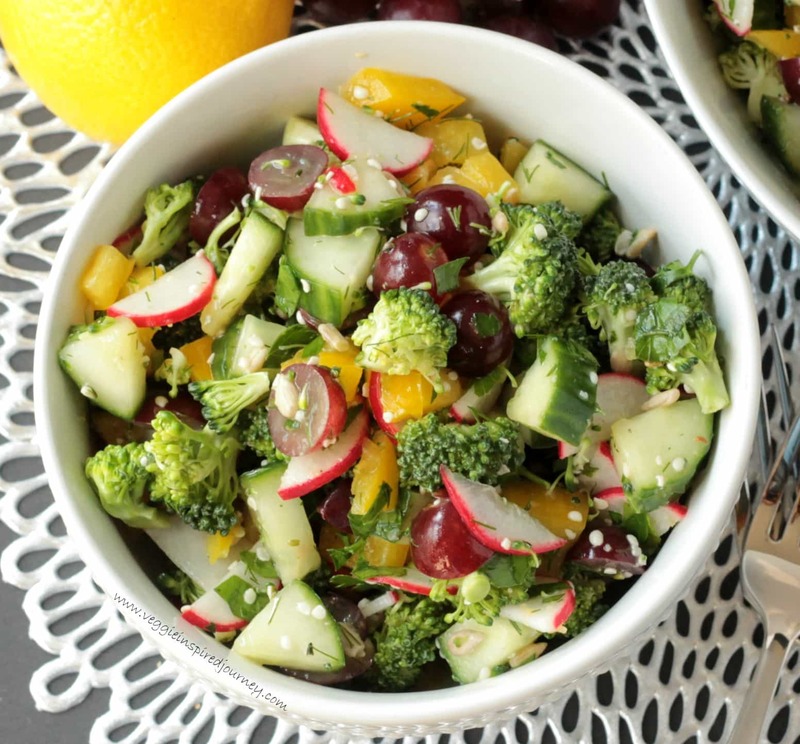 This almost raw salad is so easy and so delicious. It actually could be made raw if you prefer, but I like to steam my broccoli for just a few minutes so they are just starting to get tender, but still crunchy. Crisp veggies, sweet clementines, salty tamari, creamy tahini, tart lime juice – your taste buds will thank you. You gotta try this Broccoli & Shredded Brussel Sprout Salad! If I had to choose a favorite vegetable, it would probably be cauliflower. It is so versatile! If you haven’t tried my Crispy Cauliflower Tacos or Orange Cauliflower Stir Fry yet, you must! But, if I had to choose a favorite vegetable that my whole family collectively loves, it would be broccoli. My kids love it raw, steamed, and roasted. I feel very thankful for having such good eaters. The other day, instead of serving our go-to steamed broccoli, I decided to amp it up a bit and turn it into a salad. I had some shredded brussels sprouts leftover and we always have a bag of clementines in the fridge. It all came together so deliciously. Maple and tahini are two of my go-to salad dressing ingredients. I love the creamy tang of the tahini and a little bit of pure maple syrup always balances it out so nicely. I added some tamari for an little salty kick (no other salt needed) and some citrus juice to complement it all. It’s a strong dressing, but since the veggies are raw or nearly raw, they stand up to it really well. Brussels sprouts are part of the cruciferous vegetable family, which I’m sure you know are very good for you. These sprouts in particular have high amounts of vitamin K, vitamin C and folate. They are also high in manganese, fiber, B vitamins, potassium, omega-3 fatty acids, iron, vitamin A, calcium, zinc, and even protein. I know there are many of you out there that probably don’t like Brussels sprouts despite their superfood profile. The key is not overcook them. When overcooked they become mushy and give off a not so pleasant aroma and flavor. While I love them roasted until the outsides are crispy (see here and here), they are most mild when eaten raw. So, if you think you don’t like Brussels sprouts, try them raw! They have a nice crunchy flavor and they go perfectly into salads or slaw. I hope you guys try this Broccoli & Shredded Brussel Sprout Salad and love it as much as we do! Please come back and leave me a comment below with your feedback and star rating. You can also find me on social media. Be sure to tag @veggie_inspired and #veggieinspired so I don’t miss it. Broccoli & Shredded Brussel Sprout Salad - crunchy and tangy, this salad is perfect for a light lunch or a side dish for a larger meal. It would also be worthy of a spot on your holiday table. Steam the chopped broccoli for about 5-6 minutes*, until slightly tender, but still crunchy. Meanwhile, whisk all of the dressing ingredients together in a small bowl. When done, place the steamed broccoli, shredded brussels sprouts, and clementine segments into a large bowl. Pour the dressing over the salad (as much or as little as you want). *Alternately, you can keep the broccoli raw, or steam it longer if you like it more tender. Yum, what a great combo. I love both brussels and broccoli! Thank you, Jenni! Both delicious separately and together! Delicious. I know my mother will love this so I will have to make this for her. Perfect. I hope you both love it! This looks amazing. Have you ever roasted frozen brussel sprouts? Would it work, your think? Thanks, Maria! Yes, I bet it’s great cooked too! Jenn, your salad dressing looks too much gorgeous, colorful, healthy & light. I love both Broccoli & Brussel combination. Its really perfect for any party. Thanks for this nice salad. Thanks, Rony! I hope you enjoy it! Its my pleasure Jenn! You really deserve these complement, I really enjoyed it. So sweet. Thanks again, Rony! Have a great week! Yum! This would be awesome for Thanksgiving. I like brussels sprouts raw too! Thanks, Sarah! I think I will definitely be making it for Thanksgiving this year! Totally agree with the favorite family veggie being broccoli! I cook broccoli more than any other veggie! I love broccoli raw, steamed and roasted. This salad looks so delicious and so easy to make. Is there supposed to be maple in the dressing? You have it noted in the post, but I don’t see it in the ingredients, unless I’m totally blind, lol! Ah, thank you for catching that! I just updated it. Thanks, Brandi! Bring on the broccoli! Love shredded brussels but I’m too lazy to shred them. LOL! Love how colorful this is with that dressing! Thanks, Sina! The texture and flavor combos are definitely a winner! This salad is totally up my alley! 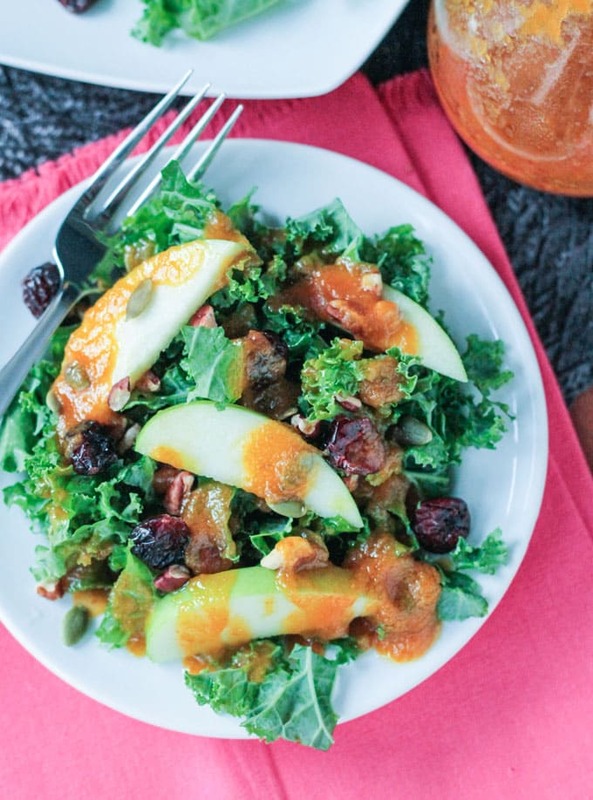 I love broccoli and Brussels sprouts, and that dressing looks incredible! Thanks, Vanessa! I might have to find a sub for the Brussels sprouts during the spring/summer because it’s just so good! So great your kids love broccoli! So many wouldn’t even go near it. Yep, it’s our go-to veggie! I love that they love their green veggies! What a gorgeous salad and lovely flavours. I love the extra bursts of citrus from the clementine segments! Thanks, Mel! The juicy clementines add a needed change of texture. What a lovely salad! It seems so festive too! Thank you. Oh, I love Brussels sprouts in any form, but for some reason, I rarely have them raw. This salad sounds like a delightful change of pace, especially with the clementines. This is like a dream salad to me! I love shaved brussels and broccoli and that dressing sounds soooo flavorful Jenn. Thanks, Alisa! Definitely not lacking in flavor. Your kids sure are good eaters! This is totally my kind of salad! They definitely have their picky moments! They do love their broccoli though! This recipe has three many of my favorite things – broccoli, brussels sprouts, and tahini – so I’m definitely going need to try it! 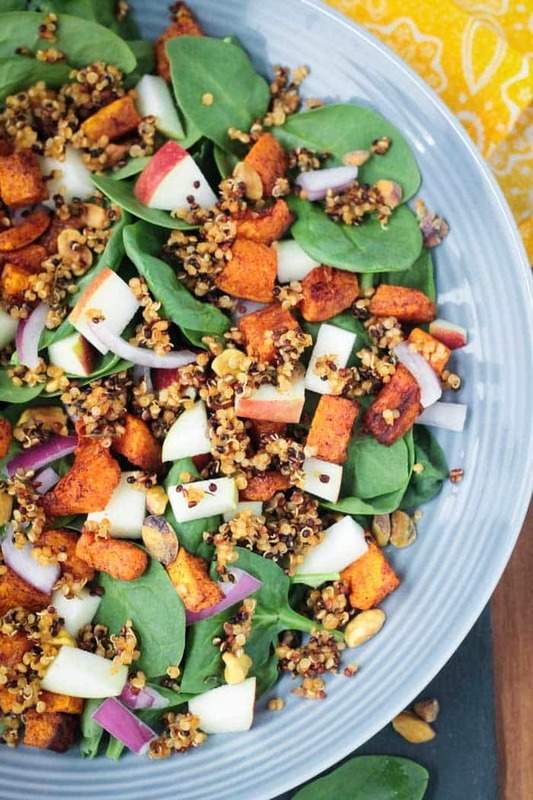 I love hearty salads like this that can take salads into fall and even winter. Thanks, Dianne! This salad will be great for the whole winter! And even the rest of the year except you probably couldn’t find Brussels sprouts – maybe cauliflower? This looks like my kind of salad! I just had the last of my leftovers with lunch. Guess it’s time to make more…it’s kind of addicting! 🙂 Thanks, Becky! Yes, they do have a bad stigma. But they are so good!! Thank you, Rebecca!